Drive or take the 7.15am train from Los Angeles to Oceanside. Board our specially designed windowless van to cruise down HWY 101. Stop at Balboa Park the largest urban park in the US + sight of the 1905 World's Fair. 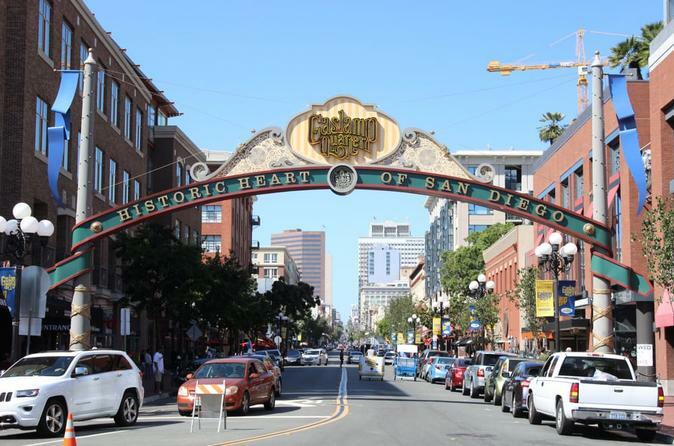 Cruise through Little Italy, Downtown San Diego including the Gaslamp district and the Embarcadero. Magnificient views on both sides of the Coronado Bay Bridge on the way to Orange Ave + the famous 110 year old Hotel Del. Over to La Jolla the jewel of San Diego for our lunch stop. Watch the seals on the cliffs before going over to the Boardwalk + Crystal Pier in Pacific Beach. Next we drive up the mountain to watch the Paragliders + Hang Gliders soar off the cliffs at the Torrey Pines Glider Port. Continuing up HWY 101 we drive through Del Mar, Cedros Ave. Design District in Solana Beach + Cardiff to arrive at the Meditation Gardens in Encinitas. Finally our last stop at Swamis surf break + back to the train. Arrive Oceanside train station at 9.14am. Board the Coastal Tours bus and depart down Highway 101 to enjoy the coastline before heading over to Balboa Park. Home to 17 museums, 3 theatres, 5 Botanical gardens + the largest pipe organ in the world. Walking around the beautiful Avenues surounded by 19th century Spanish Architecture. Back in the van we cruise through Little Italy passing the Piazzas, the central Plaza and lots of trendy bars + restaurants. Continuing along the harbor past the cruise ship terminal, the USS Midway + the Kissing Statue from World War 2 we arrive at the Convention center + the beginning of the Gaslamp District on 5th Ave. This is the heart of San Diego's downtown entertainment district. Passing the baseball stadium (Petco Park) we head across the Coronado Bay Bridge onto Coronado Island. Aircraft Carriers + thier support ships are parked at one end, Glorietta Bay + the Ferry landing on 1st Ave and Hotel Del at the end of Orange Ave. After exploring Hotel Del and Imperial Beach we arrive in Pacific Beach where we take a stroll on the Boardwalk and watch the surfers from on top of Crystal Pier. Continuing north on 101 La Jolla the jewel of San Diego is our next stop. We take a leisurely 1 hour for lunch before climbing onto the rocks to visit with the seals. Driving up the magnificient cliffs of La Jolla we arrive at Torrey Pines Glider Port. Sitting on the deck we watch Paragliders + Hang Gliders soar off the cliffs at Torrey Pines. A brief walk brings us above the cliffs at Black's Beach. The only clothing optional beach in San Diego. Back on HWY 101 we cruise through Del Mar, the Cedros Avenue Design District in Solana Beach, the Kook Statue in Cardiff to arrive at the Meditation Gardens in Encinitas. Beautiful Koi Ponds, Plants, Flowers + peaceful energy. Our final stop, the famous surf break at Swami's beach. If it's low tide we'll be able to explore the Tidepools. Heading North along 101 through Leucadia, Carlsbad and Oceanside back to the train station to catch the 5:10pm to arrive L.A at 7PM.